Airbus SE agreed to acquire a majority stake in Bombardier Inc.’s C Series program and will start assembling the jetliner in the U.S., vaulting a technologically advanced but slow-selling plane onto the front lines of the battle with Boeing Co. over global aircraft sales. Without putting up a dime at closing, Airbus will take just over half of a partnership controlling the C Series. The European planemaker’s marketing muscle and production expertise boosts the viability of the all-new aircraft after more than $6 billion in development costs forced Bombardier to rely on government assistance. The deal also thrusts Airbus into the middle of a bitter trade spat between the Canadian manufacturer and Boeing. Following a Boeing complaint that Bombardier sold 75 of its C Series jets to Delta Air Lines Inc. for “absurdly low prices,” President Donald Trump’s administration slapped the aircraft with import duties of 300 percent in recent weeks — roiling U.S. relations with Canada and the U.K., where Bombardier makes the plane’s wings. In a potential effort to circumvent the tariffs, Airbus will add another final assembly line for the C Series at its factory in Mobile, Alabama. The facility will serve U.S. customers and complement production in Canada, according to a company statement late Monday. Bombardier jumped 18 percent to C$2.81 at 9:34 a.m. in Toronto, after climbing as much as 25 percent, the most intraday since April of last year. Boeing fell 1.1 percent to $256.97 in New York, while Airbus shares rose 3.6 percent to 79.86 euros in Paris. “The main risk would appear to be only that Airbus gets distracted,” Sandy Morris, a London-based analyst with Jefferies, said in a note. It’s too soon to say if the new Alabama production line would enable the C Series to avoid U.S. tariffs. The duties were applied to C Series planes “regardless of whether they enter the United States fully or partially assembled,” according to a U.S. government fact sheet on the matter. Boeing said Airbus and Bombardier were just trying to get around the restrictions. Discussions with Bombardier started in August, said Airbus Chief Executive Officer Tom Enders. The Canadian company had also been in touch with a small group of Chinese state-owned enterprises about a C Series stake, said two people familiar with the talks. Bombardier’s talks with China included Commercial Aircraft Corporation of China, or Comac, said one of the people, who asked not to be named because discussions were private. Comac declined to comment on the Airbus deal and its media relations department said it wasn’t aware of any talks with Bombardier. The Canadian company declined to comment. The Bombardier deal marks a reversal for Enders, who personally vetoed a similar accord just two years ago, when the future of the C Series was in doubt and Airbus was grappling with the ramp-up of its bigger A350 model. Airbus isn’t interested in any other Bombardier assets, he said. “Airbus gives the program security,” he said of the C Series in a telephone interview. Whereas some customers may have wavered previously because they couldn’t be sure of long-term customer support from the manufacturer, Airbus’s industrial heft changes the equation, he said. Trump and Canadian Prime Minister Justin Trudeau discussed the deal Monday evening in a phone call, according to a statement from Trudeau’s office that provided no details of the conversation. Bombardier hasn’t landed a major order for the plane, which typically seats 108 to 160 passengers, since the Delta deal 18 months ago. 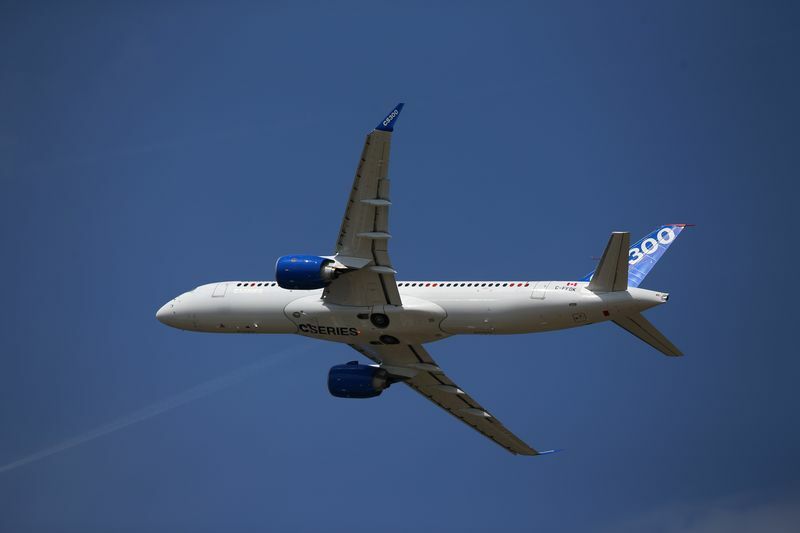 The company values the C Series at about $2 billion, and expects the joint venture to double the value of the program, CEO Alain Bellemare told reporters at a press conference late Monday in Montreal. The company has agreed to provide $350 million in funding for the C Series in the first 12 months after the close of the deal, and as much as $350 million more, if required, over the two subsequent years, said Chief Financial Officer John Di Bert. By adding the C Series to its lineup of larger jetliners, Toulouse, France-based Airbus gains a new dimension for its portfolio while offering access to a fuel-efficient aircraft with advanced technology, large windows and over-sized middle seats. The C Series is operated by carriers such as Deutsche Lufthansa AG’s Swiss unit. The all-new Canadian jet is smaller than most variants of the Boeing 737 Max, the upgraded version of an airframe that was designed 50 years ago. The same goes for most of Airbus’s A320 family of jets, which debuted in the late 1980s. Both the C Series and the A320neo, the newest version of Airbus’s single-aisle workhorse, are powered by the geared turbofan engine made by Pratt & Whitney, a division of United Technologies Corp.
After the transaction, which is expected to be completed in the second half of next year, Airbus will own 50.01 percent of the C Series partnership. Bombardier will hold about 31 percent and the province of Quebec, which invested $1 billion in the C Series after the cost overruns and delays, will have approximately 19 percent. Quebec will remain an investor in the C Series until at least 2023, said the province’s economy minister, Dominique Anglade. Canadian Innovation Minister Navdeep Bains said the deal is subject to review under the Investment Canada Act. A Canadian government official said the deal is expected to be approved after its required review. The official, who asked not to be named because the discussions are private, characterized the deal as a company-to-company agreement that nonetheless had the support of France, Germany and Canada — the latter in part because it would preserve Bombardier jobs in the company’s home country. Another official, also speaking on condition of anonymity, said the sale would have no impact on the previously announced federal funding for Bombardier. Canada pledged C$372.5 million ($300 million) in “repayable program contributions” earlier this year.